PRESENTED BY HECTOR Y. ADAMES, PSY.D. & NAYELI Y. CHAVEZ-DUEÑAS, PH.D. This workshop will provide an overview of the diverse cultural roots of Latino/as by exploring both the racial & ethnic differences within the Latino/a community. Both a historical foundation as well as practical interventions for clinicians working with the Latino/a community will be discussed. This workshop will present information grounded in current research & literature related to the Latino/a community in the U.S. today. Dr. Adames is a neuropsychologist & his research focuses on how socio-race, skin-color, colorism, & ethnic & racial group membership influence wellness. 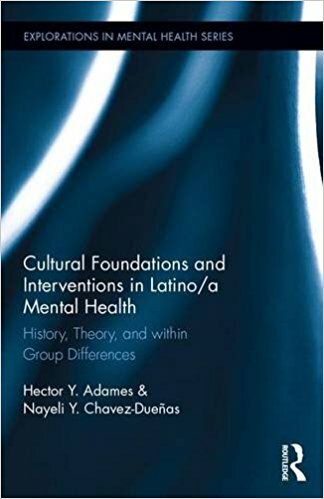 He is the editor of Latina/o Psychology Today & the co-author of a textbook focusing on skin-color & physiognomy among U.S. Latino/as titled Cultural Foundations & Interventions in Latino/a Mental Health: History, Theory & within Group Differences (Routledge Press). He has earned a number of awards including the 2014 Distinguished Professional Early Career Award from the National Latina/o Psychological Association. Dr. Chavez-Dueñas serves as the faculty coordinator for the concentration in Latina/o Mental Health in the Counseling Psychology Department. Her research focuses on colorism, skin-color differences, parenting styles, immigration, unaccompanied minors, multiculturalism, & race relations. She is the associate editor of Latina/o Psychology Today and the co-author of the textbook Cultural Foundations & Interventions in Latino/a Mental Health: History, Theory & within Group Differences (Routledge Press). She has earned a number of awards including the 2012 Distinguished Teaching Award for Excellence in Multicultural Pedagogy from The Chicago School of Professional Psychology.